Why objectiF RM by microTOOL? You are here: microTOOL / Products / objectiF RM / Why objectiF RM? objectiF RM is methodologically oriented to the standard defined by the International Requirements Engineering Board (IREB). The terminology used corresponds to that used in the Certified Professional for Requirements Engineering (CPRE) training. Put briefly: if your goal is professionalizing requirements engineering, then objectiF RM is right for you. Digitalization, IoT, industry 4.0 – there are many names for the challenges that organizations face these days. But the consequences are always the same: projects are larger, distributed and more frequent. When you have to deal with these scenarios, then you need scalable and flexible software for requirements engineering. objectiF RM has a client/server architecture with a real time repository for your project data on the basis of a central, multi-user-capable SQL database. Everything that arises in your project is saved there directly so that all project participants can see the current state of development and have access to it. objecitF RM can be used on premises, in your local network, or it can be run in an Amazon web services cloud through software as a service (SaaS). Both variants can be connected to a common virtual private network (VPL). objectiF RM can be customized to your project needs. Your objectiF RM installation can be increased with your project as it grows. 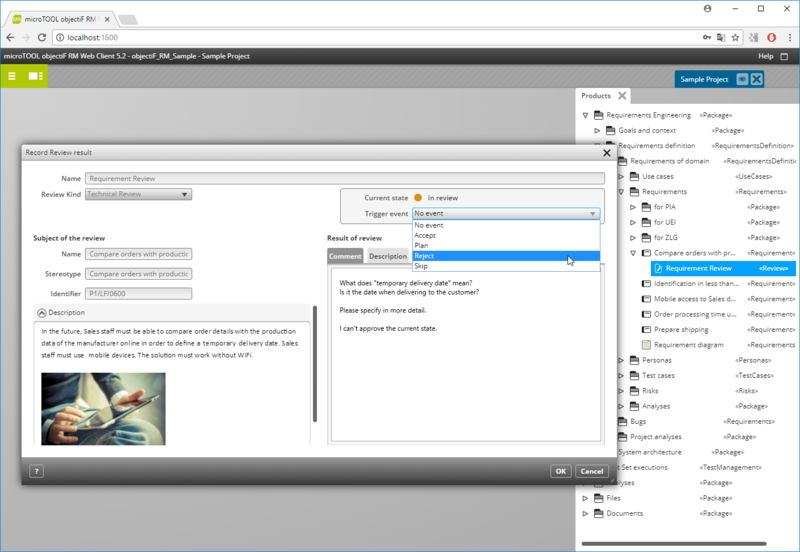 Project participants can use objectiF RM with a Windows client or access projects with a web browser. This way you can keep remote stakeholders actively involved in the project. If you use document-central techniques over the course of requirements elicitation, then you will probably be faced with the question: where should the documents that the stakeholders gave for analysis be stored? What about the material generated from interviews with stakeholders, survey results, or observation protocols: where should it all go? The answer is to use objectiF RM as a document management system and store these documents as files in directories in the repository of objectiF RM. Version them according to your needs. Your advantage: Like artifacts, the sources of requirements engineering will be centrally managed. You can access them directly. So you no longer need to search for it in the data system! Transfer files from other tools into the central repository of objectiF RM with drag and drop. This automatically subjects them to version control in objectiF RM. The file can be opened with the relevant applications by double-clicking. For connecting tools at an application level, there is a REST API for objectiF RM available. Import/export interfaces for exchanging files between projects in XMI format. objectiF RM supports diverse requirements engineering artifact types: system context, stakeholders, goals, requirements, risks, use cases, personas, classes, components, test cases, test executions, bugs, etc. But requirements engineering is different in every organization. That is why objectiF RM can be adapted to your business and projects. Create custom needs-based forms for editing artifacts. objectiF RM has an integrated form designer for this. Forms designed with it seamlessly return to the user interface of objectiF RM. Change state-controlled workflows and define them yourself. Can be exchanged between projects. With custom and adapted artifact types and workflows, you can support methodical procedures efficiently in requirements engineering. For distributed projects, objectiF RM offers multiple options: You can use objectiF RM classically in LAN. Project participants who do not have access can work in the central real time repository of the project online with a web browser. Or just run objeciF RM in the cloud. Deriving requirements from stakeholders’ emails. Confirmation processes are simpler and quicker in large projects. Intensive cooperation with stakeholders leads to higher quality common derived solutions. An example of online collaboration: Carry out a requirement review in the browser.